While we debate whether machines will replace humans, or simply augment their work, questions arise about whether tomorrow’s workforce that can adapt to changing environments and has skills necessary to be successful. According to a recent survey by the American Psychological Association, that may be where companies falling short. In fact, training and development consistently emerge as one of the areas employees are least satisfied with, and a lack of opportunity for growth and advancement is second only to low pay as a source of work stress. So what can be done? Some recommendations include making training and development a part of both an employee’s job and their manager’s; setting aside dedicated time for training; and reward training efforts. As topics like automation, artificial intelligence, and skills retraining dominate conversations about the future of work, some predict catastrophic job loss and a dystopian future where legions of unskilled workers languish unemployable in the margins. Others, like O’Reilly Media’s Tim O’Reilly, aren’t so pessimistic. They remind us that we’ve been here before and that, rather than simply increasing efficiency and cutting costs, emerging technologies can be used to augment our work and raise the quality of life for the population as a whole. Regardless of which view prevails, navigating this terrain requires a workforce that can adapt to changing environments and acquire the skills necessary to be successful in the future. And that’s where we are falling short. In the surveys of the U.S. workforce that we conduct at the American Psychological Association, training and development consistently emerges as one of the areas employees are least satisfied with and lack of opportunity for growth, and advancement is second only to low pay as a source of work stress. While 87% of the 1,076 respondents in APA’s 2017 training and development survey felt confident about their current job skills, feelings of optimism about the future were more tenuous among American workers. More than one in four are concerned about the changing nature of work. Sixty-one percent say their employer is helping them develop the technical and soft skills they’ll need in the future. Half say their employer provides adequate opportunities for internal career advancement. And while employees acknowledge that staying up-to-date on competencies is important, a recent Randstad survey found that more than a third of U.S. workers report that they haven’t done anything to develop new skills in the past year. Although it’s reasonable to expect employees to keep their job skills up to date and actively pursue training opportunities, it’s clear that the responsibility can’t just be with individuals. As we began analyzing the results of our recent survey, we fully expected to see supervisor support emerge as important to training and development. What we didn’t anticipate, however, was how powerful that link would be. We also identified several other areas where workers reported discrepancies in the opportunities available to them. Supervisor support. For employees who lack supervisor support and encouragement for career development, only 15% say they their employer is providing them with opportunities to develop the technical skills they will need in the future, only 20% say their employer provides training in necessary “soft skills,” such as teamwork and communication. Just 8% report having the opportunity to develop necessary leadership and management skills. With a supportive supervisor, those numbers jump to 75% and higher. Lack of supervisor support for career development is also linked to important organizational outcomes. For working Americans without supervisor support, only 48% say they are motivated to do their best at work, 39% are satisfied with their job, 16% say their company or organization makes them feel valued, and 22% would recommend their organization as a good place to work. If those figures don’t make business leaders take note, consider that, in the absence of supervisor support, more than half of U.S. workers say they don’t trust their employer and intend to seek employment outside the organization within the next year. Given these findings, we took a closer look at what drove perceptions of support. Employees reported feeling more supported by their supervisor when they were provided with opportunities to develop the technical, management, and leadership skills they believe they will need in the future and when there was an explicit expectation that they participate in job-related skills training and career development activities. In predicting supervisor support, these factors accounted for 60% of the variance. Having adequate time available to participate in career development activities and sufficient opportunities for internal career advancement were also related to perceptions of supervisor support. Gender. Our survey results also show that some groups may not be afforded the same growth and development opportunities as others. Clear differences are evident when it comes to how men and women view their opportunities for training and career development, with women faring worse than men. Both men and women report that they have the technical skills necessary to perform their current jobs well, but fewer women than men say their employer is providing them with opportunities to develop the technical, soft, or leadership skills they’ll need in the future. Education. The survey results also highlight gaps between employees with and without a college degree. Nearly three-fourths of employees with a college degree said their employer values training and development, while 64% of those without one said the same. 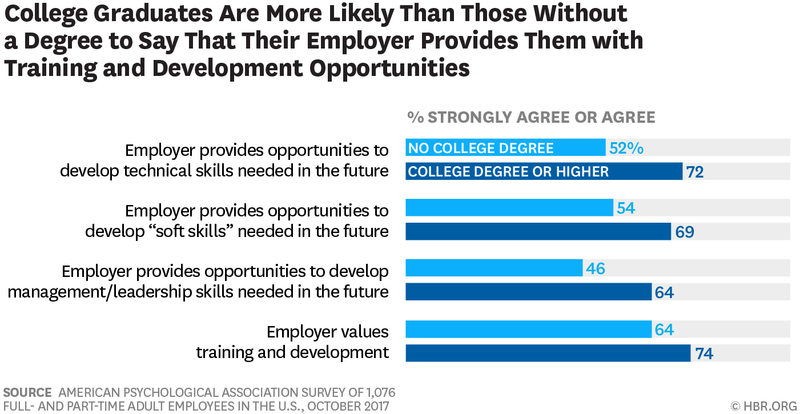 Regarding technical skills needed for the future, 72% of those with college degrees said their employer provides opportunities for training and development, versus about half of those without a degree. Job type. Similarly, we see differences based on where people fall in the organizational hierarchy. In an earlier survey compared to front-line workers, senior leaders were more likely to say they are satisfied with the growth and development opportunities available to them, that they regularly participate in training activities, and that they have sufficient opportunities for internal advancement. Set employee expectations. Make ongoing job skills training and career development part of the job. Build it into job descriptions, make it clear to employees that staying on top of their game and preparing for the future is part of their job, and include it as part of their regular performance evaluations. Set supervisor expectations. Make developing employees part of every manager’s job description and train them in how to effectively work with employees to set training and development goals, monitor progress, and provide feedback. Evaluate supervisors on how well they develop their staff. Set time aside. Only about half of working Americans say they have adequate time available to participate in career development activities. Allocate time during regular work hours for training and development, so employees don’t have to neglect other job duties, put in extra hours or use non-work time to prepare for the future. Align training and development activities to fit with employees’ workload and workflow, so they don’t place undue demands on employees during times when they are already stretched thin. Focus on training and development. Provide both job-specific skills training and development activities that help employees advance within the organization or relative to their broader career goals. Involve employees in the process of identifying the knowledge, skills, and abilities they’ll need in the short and long run, and align training and development efforts with larger organizational goals. Provide opportunities to practice. For the new knowledge and skills gained during training to stick, employees need to actually apply them on the job. In our survey, only 58% of U.S. workers said their employer provides opportunities for them to do so, which means resources invested in training are often squandered. Reward and recognize employees for their training and development efforts. Build a learning organization where people are committed to ongoing learning and development by reinforcing the behaviors you want to see in employees and managers. Openly praise employees who seek out training opportunities. Celebrate people who earn new credentials or certification. Highlight managers who are putting effort into developing their staff and moving the organization forward. Eliminate disparities. Don’t assume that senior management’s views of your organization’s training efforts reflect those of your employee base. Be sure people at all levels throughout the organization have access to development opportunities that meet their needs. In addition, consider the diversity of your workforce when you design, develop, implement, and evaluate your efforts and ensure that all employees have the resources they need to be successful. While there are many uncertainties about the future of work, one thing is sure: Adapting to a rapidly changing environment requires a strategic approach to training and development. It’s the best way to ensure that employees can see what is possible, solve previously intractable problems, and do the work that will lead to a prosperous future.